Roses are red; violets are blue — It’s all obvious! Well, is that true? I have attended the main hearings in both these nullity cases, i.e. O2016_010 relating to EP 2 347 250 B1 (see EPO Register and Swissreg ) and O2016_011 relating to EP 2 352 018 B1 (see EPO Register and Swissreg). Note that EP’018 is based on a divisional application of EP’250. The inventions are all about the capacitive testing of yarns or fabric, wherein the dielectric property of a capacitor arrangement is determined. 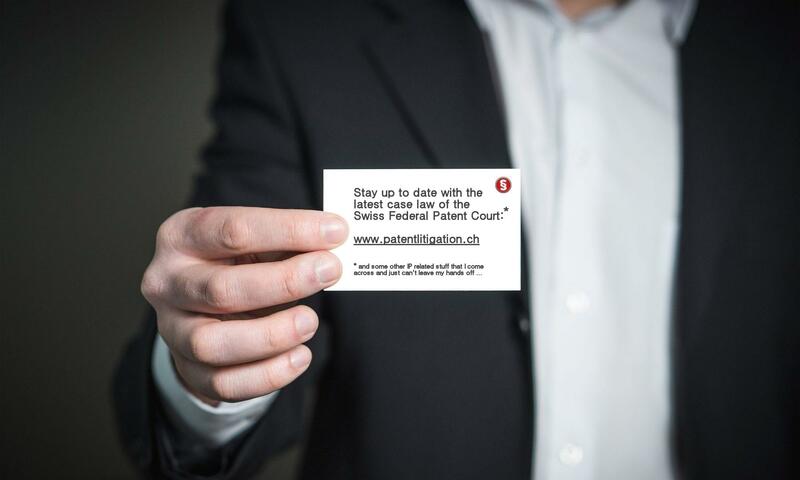 It became clear from the pleadings that the defendant’s main request in both cases was that the patent be maintained in amended form only. In my understanding, the expert-opinion of the judge-rapporteur had held that the main request in O2016_010 / EP’250 was allowable, but not in O2016_011 / EP’018. Novelty has not been an issue anymore, in both cases. Only obviousness, undue extension of subject-matter (interim generalisation) and clarity (of the additional feature) have been discussed. D2 (US 4,843,879; referred to in EP’250, ¶) was apparently agreed to be the closest prior art, and was combined in the assessment of obviousness with either D4 or D11 — both of which have unfortunately not been identified. That’s not chemistry here; it’s physics! It is therefore the aim of the present invention to provide a method for the symmetry adjustment of a device for the capacitive examination of a moving elongated textile test sample which does not have the above disadvantages. The device should be simple, fast, cost-effective and, in particular, automatically adjustable. She likes flowers, in particular roses. 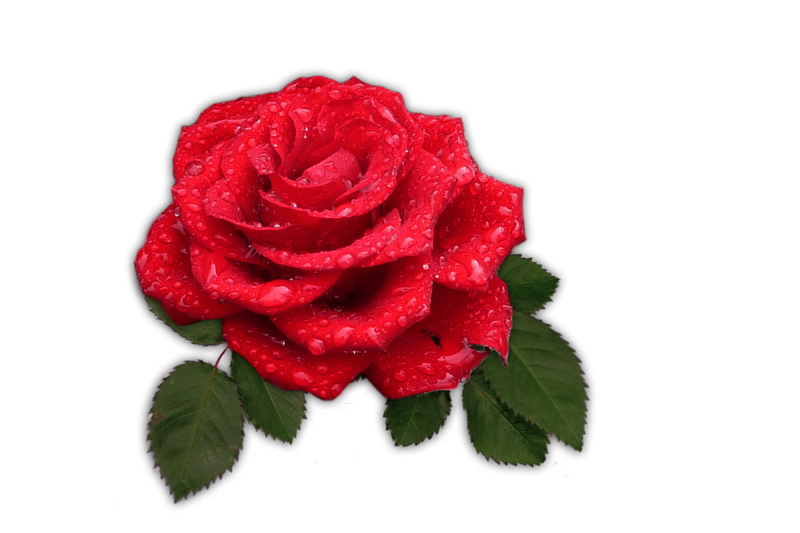 Now, imagine that the rose-loving woman visits a florist. Which flowers will she recognise first, amidst all the other flowers? The roses, of course! 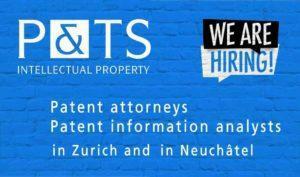 Compensation of the ‘necessary expenses’ for the assisting patent attorney pursuant to Art. 3 lit. a and Art. 9(2) CostR-PatC was yet another point of discussion. 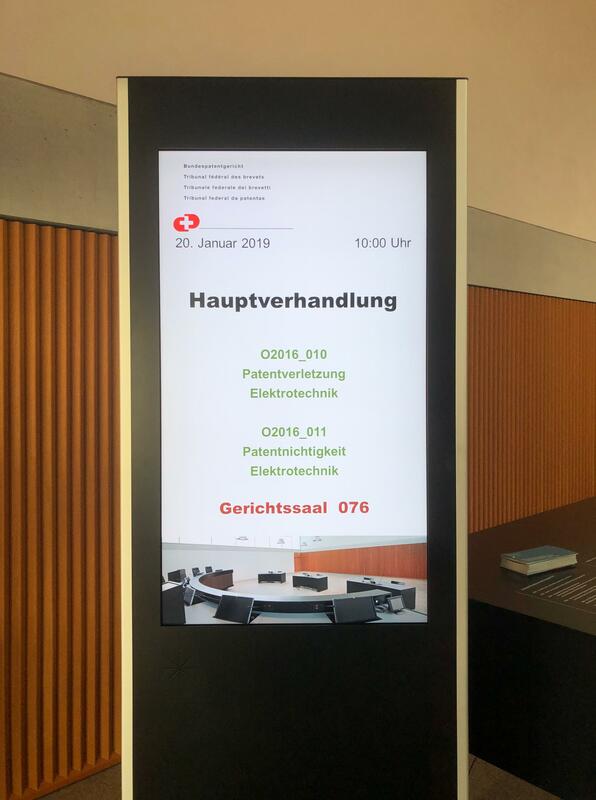 The plaintiff requested reimbursement of about kCHF 45 for each case and argued, that the defendant triggered the additional costs because the amended claims had only been filed with the rejoinder which then had effectively restarted the whole discussion. 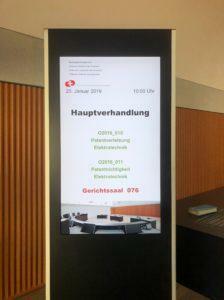 I did not get the value in dispute, but the presiding judge indicated that kCHF 45 is about twice as much as the amount that would be awarded for legal respresentation, i.e. ‘according to the tariff’ that is based on the value in dispute. Since O2012_043, the FPC’s practice is that, as a rule, the ‘necessary expenses’ for the patent attorney may well be within the same order of magnitude of the costs for legal representation. But what about nullity cases? A patent attorney could do that on his/her own, without any legal representative; Art. 29(1) PatCA. 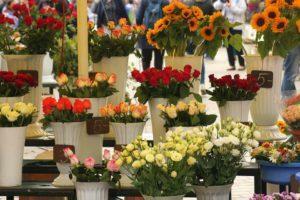 Compensation would then be awarded according to the tariff for legal representatives; Art. 9(2) CostR-PatC. The defendant questioned whether costs incurred for the assisting patent attorney are ‘necessary expenses’ at all, on top of the costs for legal representation according to the tariff, if he/she could have done the whole case on his own. It is quite hard for the public to follow the arguments when the representatives just argue with acronyms and references. It’s sometimes frustrating, but I got used to it. But still, one of the basic ideas of a public hearing is to give the public the opportunity to follow the proceedings, isn’t it? But how would you even get a glimpse of what is really at stake when the parties only refer to ‘EP’111’ or ‘D1’ or ‘feature 1da’. That’s not information — it’s just noise. 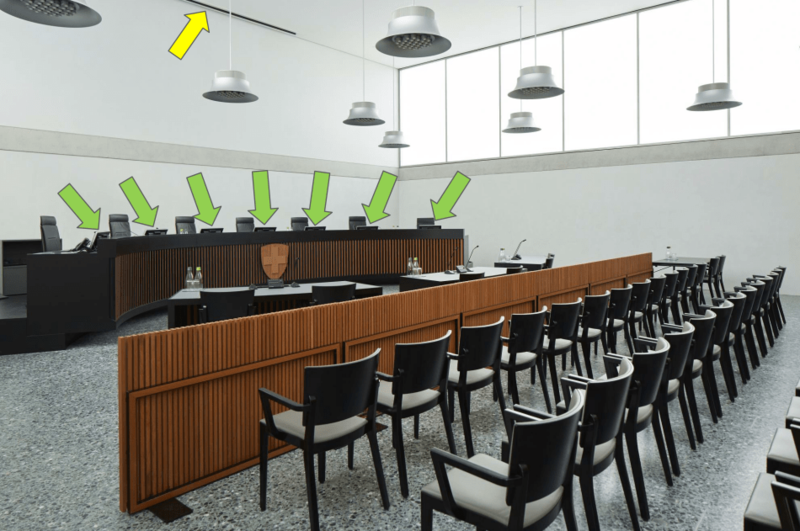 I was very happy that the recent hearing in case S2018_006 was different (see this Blog here): Whenever someone referred to a specific document, the President put the same on the screen for it to be easily recognisable by the whole audience and the judges; projector and screen are fixedly installed in the ceiling anyway (see yellow arrow in the image below). Much appreciated! But that’s not only great for the audience; I strongly feel that it is also beneficial for representatives when arguing their case. 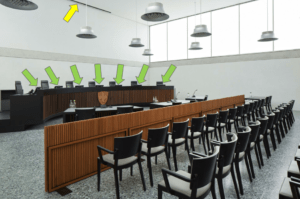 When referring to a certain paragraph in a specific document in your pleadings, or a technical drawing, you always want to make sure that all the judges are on the same page, right? But how would you know that, with the judges sitting on a podium that even has an elevated front side that makes sure that nobody reveals a hand up there, behind the monitors. Yes, there are fixedly installed monitors (green arrows in the above image). Now, did they all pick up the document that you are upon to discuss? You never know. So, why not actually use the monitors that each judge has in front of him/her, and the projector/screen for the audience, to make sure that everybody sees what you want to be seen? I could not think of any more powerful way to focus the discussion and thoughts on a specific argument. Unfortunately, it didn’t work out that way in this hearing even though the defendant suggested it. I hope this was for technical reasons only, and does not indicate a general change of practice again.